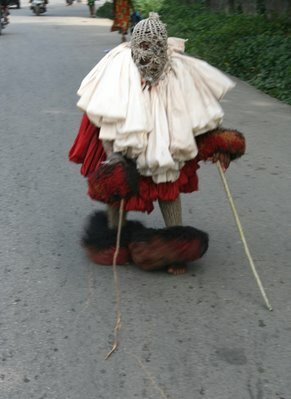 At Christmas time, there is almost a masquerade on every street in Calabar. All the civil servants are on holiday for the whole month, so there is a festive air across the town.. This one did a very interesting shuffle dance for the camera, twisting and whirling and making the ground rustle with his deft footwork. "civil servants on holiday for the WHOLE month," now that should be a scary thought. Makes one wonder how the state functions during december, and is it a paid holiday? hehe damola, ur naija now, it shouldnt be a surprise, its always been that way. Even if the ministries dont agree, the workers wont be there!!! hahah that looks like so much fun. Oh my gosh I miss Nigeria is nor even funny!